Health Workforce Australia (HWA), the Commonwealth authority established to advise State and Federal health ministers, has predicted that by 2025 Australia will be short 2700 doctors. This is assuming we continue our current rate of importing overseas doctors and that State and Federal Governments succeed in finding intern places for the 182 medical school graduates who are currently unable to continue their training in Australia. Forget the town with no beer – Bulahdelah, population 1500, is the the town without a doctor. For 13 months the community has tried everything to attract a medico – even hanging a giant advertising banner on the freeway. The doctor’s house has been renovated, the hospital has had a $100,000 upgrade and Bulahdelah’s best cooks are now offering weekly home-made treats in the latest bid to ease the crisis. RURAL health care is at crisis point, with ageing “baby boomer” GPs retiring in growing numbers and leaving a lack of suitable replacements. The average age of the state’s fully-trained rural doctors is 55, with 70 per cent due to retire in the next decade, health figures show. 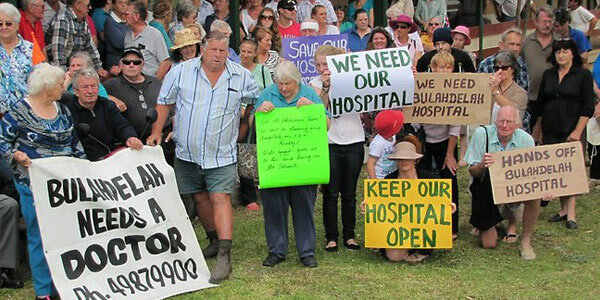 Many bush hospitals in NSW are struggling to fill positions, with one in six vacant, leaving communities reliant on expensive locums. MARYBOROUGH’S shortage of GPs has reached crisis proportions with people in large areas of its electorate now struggling with less doctor access than the national average. The problem has deteriorated to such extremes the heritage city and some of its outlying towns are now declared district of workforce shortages (DWS). “It’s a damning picture of how hospitals are performing. These statistics point to a hospital system under extreme pressure. Dr Snowball also blamed the delays on WA’s severe shortage of general practitioners, which resulted in the highest percentage of preventable presentations at emergency departments. When school teacher Emily Lloyd moved from Melbourne to Bendigo in 2005, she thought people were joking when they said she would need a personal reference to get in to see a general practitioner in the area. She soon found out they weren’t. Lloyd, 33, fell ill with a serious virus and rang five clinics in Bendigo to try to see a doctor. Each time, she was told they weren’t seeing new patients and to try elsewhere. Lloyd became progressively sicker and ended up in hospital. After this, whenever she had a serious medical problem she would first call a family friend who was also a GP, and on his advice would travel the 150 kilometres to Melbourne to see her family doctor. It took a further two years before she was accepted into a clinic in Bendigo, and this only came through contacts. Australia could face a chronic doctor shortage within five years as a “silver tsunami”of GPs heads towards retirement, a study released today shows. Nearly 40 per cent of GPs are aged 55 or more — in 1999-2000 the figure was 27 per cent. A further 34 per cent are aged between 45 and 54. Doctors and opposition politicians called on the Federal Government to take urgent action. In Queensland the doctor shortage facing one rural community has become so bad that the local pharmacist says she’s taken to giving out drugs without a prescription. The town of Cunnamulla in the state’s southwest had been without a doctor for almost two years. It’s calling on governments to be more realistic about the incentives to deal with the shortage of around 900 doctors throughout rural Australia.